Audio-Technica announces that its BP893cW MicroEarset Omnidirectional Condenser Headworn Microphone is now available packaged with Audio-Technicas 2000 and 3000 Series wireless systems. 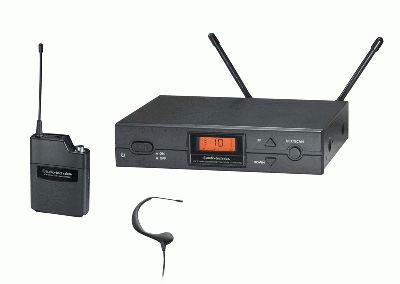 The new product bundles, otherwise known as ATW-2193a 2000 Series and ATW-3193b 3000 Series wireless systems, come with BP893cW MicroEarset (choice of black or beige microphone), 2000 or 3000 Series receiver and UniPak body-pack transmitter. The BP893cW is Audio-Technicas wireless version of its successful BP893 MicroEarset. With its ergonomically molded earpiece and unobtrusive one-inch boom, the BP893cW offers inconspicuous placement along with clear, consistent voice pickup. Its extended frequency response provides natural sound reproduction, and its lightweight low-profile design and ease of use make the microphone ideal for use in theatrical performances, houses of worship and broadcast studios. The BP893cW is positioned unobtrusively over either ear. Its omnidirectional miniature condenser capsule offers outstanding pickup tailored for crystal-clear vocal reproduction, similar to that of a high-quality lavalier microphone. The BP893cW includes a 55-inch (1.4-meter) permanently attached miniature cable terminated with a locking four-pin connector for use with Audio-Technica UniPak transmitters. A-Ts 2000 Series frequency-agile True Diversity UHF wireless system delivers professional audio and RF performance unheard of in its class. Straightforward setup, automatic scanning, and other advanced wireless features bring the systems performance to a standard that provides the audio quality and reliability necessary for sophisticated systems. Offering up to 1001 selectable UHF frequencies in 25 kHz spacing in three available frequency bands (including the new I Band 482 MHz507 MHz), Audio-Technica's 3000 Series delivers outstanding professional performance. Nine pre-coordinated frequency scan groups simplify selection of usable frequencies in a multi-channel wireless system. The versatile UniPak features a backlit screen for easy reading in low-light situations and a locking battery door for added security. A three-position sliding cover on the transmitter's control panel prevents accidental shutoff or channel-switching.